CALGARY — Johnny Gaudreau scored in overtime for the Calgary Flames in a 6-5 win over the visiting Philadelphia Flyers on Wednesday. Gaudreau scored 35 seconds into extra time. The Flames (20-10-2) regained first place in the NHL’s Western Conference vaulting over the Nashville Predators, which are at home Thursday to the Vancouver Canucks. The Flames topped the conference Saturday when they downed the Preds 5-2, but Nashville had pulled ahead with a win over the Ottawa Senators. Philadelphia (12-13-4) continues to toil in the Eastern Conference’s bottom tier. The Flyers are 2-2-1 since the Nov. 30 firing of general manager Ron Hextall. Chuck Fletcher replaced him four days later. Trailing 5-3, Calgary’s Sean Monahan and defenceman Rasmus Andersson scored in the final 68 seconds to force overtime. Monahan had a pair of goals in the game with Mark Giordano and Sam Bennett also scoring for the hosts. Matthew Tkachuk had four assists. Giordano returned to the lineup after serving a two-game suspension for kneeing Minnesota Wild captain Mikko Koivu on Dec. 6. 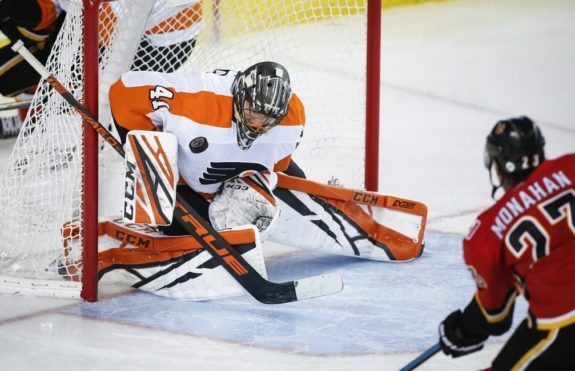 David Rittich earned the win with four saves in relief of Mike Smith, who stopped 10 of 14 shots through two periods before he was replaced to start the third. After sitting out two previous games with a lower-body injury, Sean Couturier had two goals and an assist for the Flyers. Philadelphia also got goals from Travis Sanheim, James van Riemsdyk and Dale Weise. Captain Claude Giroux collected two assists. Goalie Anthony Stolarz made 35 saves in the loss. Couturier stripped Calgary defenceman Noah Hanafin of the puck at the point and went in alone to score on Rittich at 11:30 for a 5-3 Flyers lead. Monahan’s power-play goal at 10:13 of the second pulled Calgary within one. Tkachuk dished to Monahan in the slot for the latter’s team-leading 19th goal. The Flyers scored a trio of goals in a 48-second span starting at 5:55 of the second period for a 4-2 lead. Weise fooled Smith with a soft shot from just inside the blueline at 7:43. Couturier got behind Monahan for a back-door pass from Voracek to score at 6:27. Van Riemsdyk pounced on a loose puck off a broken play in front of Smith, beating the Calgary goaltender stick side for a power-play goal to kick off Philadelphia’s outburst. Giordano beat Stolarz stick side for a short-handed goal at 5:32 for a brief 2-1 Calgary lead. Sanheim pulled the visitors even 52 seconds into the second taking a cross-ice pass from Giroux and going forehand to backhand on Smith. Bennett banged in a rebound on Stolarz stick side at 9:13 of the first period after Tkachuk attempted a wrap-around goal. Notes: Philadelphia broke an eight-game power-play drought with its first goal since Nov. 17 . . . Calgary centre Mikael Backlund sat out a third game after taking a hard hit from Wild defenceman Matt Dumba last week . . . Flames forward Michael Frolik (lower body) and defenceman Michael Stone (blood clot) and Juuso Valimaki (lower body) have been out of the lineup for 10 straight games.